Jason Warner, who currently serves as Magistrate of the Marion Municipal Court, has announced that he is running to become Judge of the Marion County Court of Common Pleas. 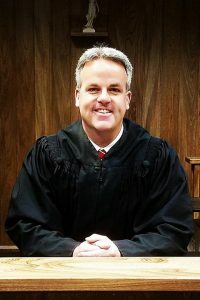 He is running to fill the seat that will be open as a result of Judge William Finnegan’s decision not to seek re-election. Magistrate Warner says that he is running for Judge because he has been encouraged to do so by countless citizens of Marion, including dozens who serve in the law enforcement community. Warner further stated that he is running because he is extremely concerned about current trends in Marion, and he believes that he can make a difference. Warner referred to the significant changes in crime rates in Crawford County since Judge Sean Leuthold took the bench as an example of the kind of impact that a Common Pleas Court Judge can make. Warner graduated from Pleasant High School in 1988. He attended the Ohio State University and was a walk-on member of the Ohio State football team for two years. He received both his bachelor’s degree (1993) and his law degree (1996) from Ohio State. Magistrate Warner worked as an attorney in private practice for 6 years, during which time he also served as a prosecutor for the City of Marion. He was appointed to the position of First Assistant Law Director/City Prosecutor in 2002, and he served in that role for 9 years before being appointed by Judge Teresa Ballinger to his current position as Magistrate in 2011. In the more than 6 years in which he has served as Magistrate, Warner has presided over thousands of cases, including misdemeanor criminal cases and a wide variety of civil cases. He also presides over the bond hearings and preliminary hearings in felony cases when felony charges are initially filed in the Municipal Court. Most felony cases are ultimately transferred to the Court of Common Pleas. Warner is an active member of the Cornerstone Alliance Church, where he serves as a member of the Governing Board and as an Elder. He has also served the community as a mock trial advisor and as a football and baseball coach, as he is passionate about any opportunity to have an impact on Marion’s youth. Warner is a member of the Marion County Bar Association, the Ohio State Bar Association, and the Ohio Association of Magistrates. While judicial races are non-partisan, Warner has filed petitions to run in the Republican primary, and he is running with the support of the Republican Party. Warner lives in Marion with his wife Julie, a teacher, and they have two sons: Joshua (18), a freshman at the University of Cincinnati, and Ethan (17), a junior at Pleasant High School. For more information you can follow “Jason Warner for Judge” on Facebook. You can also contact his campaign at warner4judge@gmail.com.